For consumers in the market for a new car, it can be difficult to keep up with all of the new—and newly redesigned—models that have been released since they last bought a car. Autotrader’s editorial team is helping consumers narrow down the many choices on the market today by selecting the top 10 vehicles that shoppers should experience for themselves. 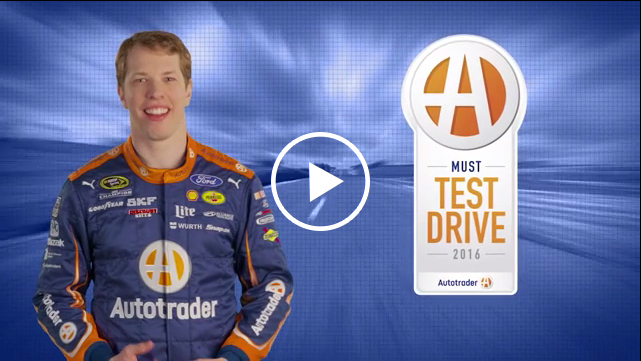 Announced today, Autotrader’s Must Test Drive vehicle lineup for 2016 includes a wide range of body styles to ensure that no matter what kind of vehicle a shopper is considering, the list will point them in the right direction for their next purchase. 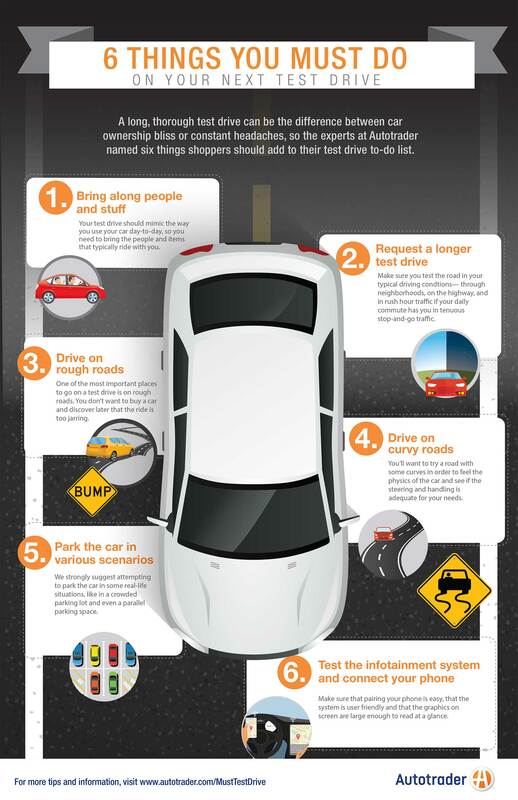 A car is typically one of the biggest purchases a consumer makes, and a recent Autotrader survey showed that 84 percent of consumers say it is extremely important to test drive a vehicle they’re considering. 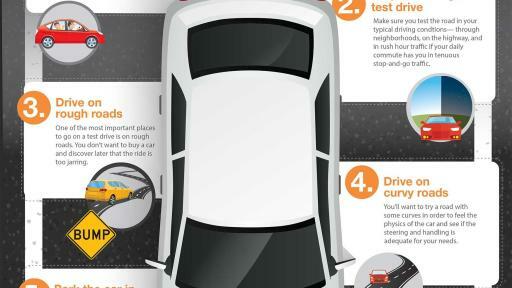 The top three things they look for during test drives are performance, comfort and handling. While 30 percent wait to test drive vehicles until they know the exact model they want to buy, 44 percent get behind the wheel when they’re still considering a few options. The annual Autotrader Must Test Drive awards program is a uniquely consumer-focused accolade designed to showcase vehicles that shoppers definitely need to take for a ride before deciding what to buy. Selected vehicles are ones that can change the way a consumer perceives the model—or even the entire brand. The awarded vehicles are chosen based on a diverse set of criteria outlined by Autotrader’s editorial experts, who log thousands of miles test driving the latest cars, trucks and SUVs on the road each year. 2016 Chevrolet Malibu: The all-new 2016 model competes with the very best cars in the segment. The Malibu feels agile and light on its feet and has a long list of available high-tech features, including Apple CarPlay™ and Android Auto. 2016 FIAT 500X: The FIAT 500X competes in the hot new subcompact-crossover segment. The 500X is roomy, offers more-than-adequate power, is as capable and efficient as rivals and is reasonably priced. 2016 Honda Civic: Car shoppers may find themselves dazzled by the new Civic's generous interior dimensions, its impressive list of available equipment and its truly fantastic interior. The latest Civic offers the car's usual benefits, such as reasonable pricing, several engine and body style choices, and notorious durability. 2016 Kia Sedona: The Kia Sedona comes equipped with a comfortable interior, handsome exterior styling and a surprisingly sporty driving experience. Then there's the long list of amenities, which includes everything from reclining second-row captain's chairs to adaptive cruise control. 2016 Lincoln MKC: A stylish, well-designed compact luxury SUV, the MKC isn't too big or too small. Instead, it is sized just right to compete with rivals, and it offers just as many high-tech gadgets, if not more. The MKC is also sporty and yet surprisingly efficient thanks to a turbocharged 4-cylinder engine. 2016 Mercedes-Benz GLC300: The Mercedes-Benz GLC300 is a handsome new luxury crossover that makes a huge leap forward over the increasingly outdated GLK it replaces. The GLC features nicely balanced steering, crisp design and premium materials throughout the cabin. 2016 Nissan Titan XD: The Nissan Titan XD is uniquely positioned between standard light-duty pickups and traditional heavy-duty trucks, which is only bolstered by its available Cummins V8 turbo diesel engine. A surprisingly quiet cabin and compelling trailering features add to the appeal. 2016 Subaru Legacy: The Subaru Legacy touts standard all-wheel drive, strong gas mileage, reasonable pricing and a very inexpensive suite of modern safety gadgets, such as lane-departure warning, automatic forward-collision braking and a blind spot monitoring system. 2016 Toyota Prius: The fully redesigned 2016 Toyota Prius is now better than ever, especially in the Touring trim level, touting a futuristic exterior design and a sharply upgraded interior that looks both modern and high-class. 2016 Volvo XC90: The new Volvo XC90 sets the standard in virtually every category: style, technology, safety, comfort and equipment. It's also surprisingly well-priced for a luxury SUV. In addition to the criteria above, consideration is only given to vehicles that car shoppers can buy at the time of the award announcement, are of the current or next model year, have a base price under $75,000, offer a significant value for the asking price and scored no lower than a four on Autotrader’s five-point rating scale in a variety of categories, including exterior styling, interior quality, cargo capacity, included and available technology and ride quality. To read more about why the Autotrader editors selected each of the vehicles, and to learn how to make the most of your next test drive, check out www.Autotrader.com/MustTestDrive.